The sun's come out after work in Lyon and the whole city collectively sighs "Et si on allait prendre un verre?" Place Sathonay and Place de Terreaux are crowded with gones basking in the evening sun. The cherries are in full bloom in front of Café des Negotiants and Café Perl. Every bar in between with a square foot of sidewalk has set up their own personal street-side terrace. You can find a spot if you just keep walking. We open the windows and let the early evening in. This time of year we always keep a cool bottle of something in the frigo to have ready when friends stop by. Isn't it better to have a warm little mouthful or two to savor instead of the typical potato chips with apéro? 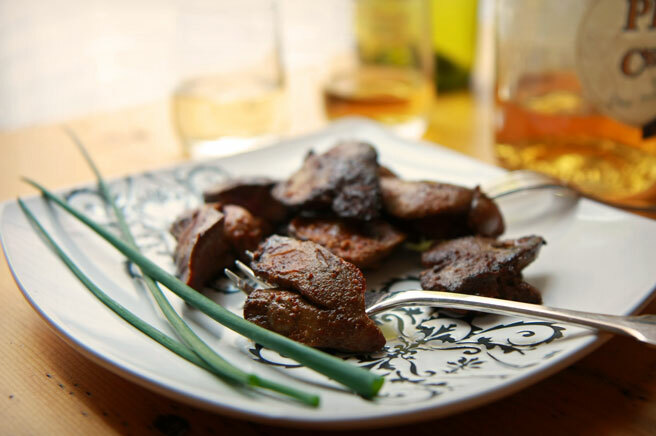 Chicken livers, when prepared just so, are a surprisingly delicious way to start an evening. Even though les foies de volailles are about as cheap as you can get, running at about 50 cents a pound in these parts, these little morsels always make people feel special. *about mixing the seasonings: My "dirty coffee grinder" is one I use to grind spices just before cooking with them. I have found that using the whole spices instead of buying pre-ground powders really adds something to the flavors. It has become a habit in my kitchen. Sometimes I toast the grains in a dry hot pan just before grinding, sometimes not. It depends on my mood. After each use, I wash the cap, take a stiff brush to the blade and bowl, and put it away for next time. Inevitably, there's always some residue around the blade, so it's kind of a work in progress at all times. I use my dirty coffee grinder for grinding vanilla beans with sugar from time to time for sweets, and I've never had my sweet cookies, bars, cakes or ice creams come out corrupted in any bad way by whispers of savory spices past. - Mix the seasonings: The coriander seed, anise seed, juniper berries, the paprika and cayenne, dried garlic, mixed peppercorns, (black and pink) go into the grinder with the spoonful of coarse sel de Guérande. Blitz until it turns to powder. If you don't have a coffee grinder devoted to spices and you don't see doing it just now, know that you can do this in a mortar & pestle easily enough. Just a dusting is sufficient for the livers before they hit the hot pan, so you might have some leftover. - Remove the fibrous strands that connect the lobes of the chicken livers together by holding them in your fingers at the center part where they come together, pinching them gently with your fingers, and pulling out, sliding the tender meaty parts off the strands. - Dust the prepared livers on all sides with your freshly ground seasoning powder. - Heat a shallow frying pan and add 1/2 the butter, letting it spread across the pan and foam. - When the foam subsides, spread the seasoned chicken livers around the pan, giving them plenty of room. The pan should be hot. If you crowd too many in the pan, they'll steam and you won't get the crispy brown crust. - Gently nudge them to see when they release from the pan. They'll release when they're done on that side. - Flip them over and sear them on the other side. Serve the first batch right away and put the other ones on to sear. Let them cook just until crispy on the outside, and they begin to seep their juices. Serve these babies hot on a pretty plate with toothpicks or little forks. They go very well with most apéretifs: Pineau des Charantes, Muscat, a splash of Lillet, a house kir (for example with your verbena syrup), or even just a naked sparkling wine like Crémant de Bourgogne or Clairette de Die. This spice mixture got my attention. I would never have thought to combine it with chicken livers, but will have to test and taste this one. Funny, you'll find the exact same coffee grinders in my house. Thanks for the recipe, I will serve it for an appetizer for my next company. These sound delicious! I grind rice after each batch of spices, the rice cleans the grinder right out. Have heard the way to clean a spice/coffee grinder is to put a piece of soft bread in and give it a whirl. The bread clears all traces of dust.